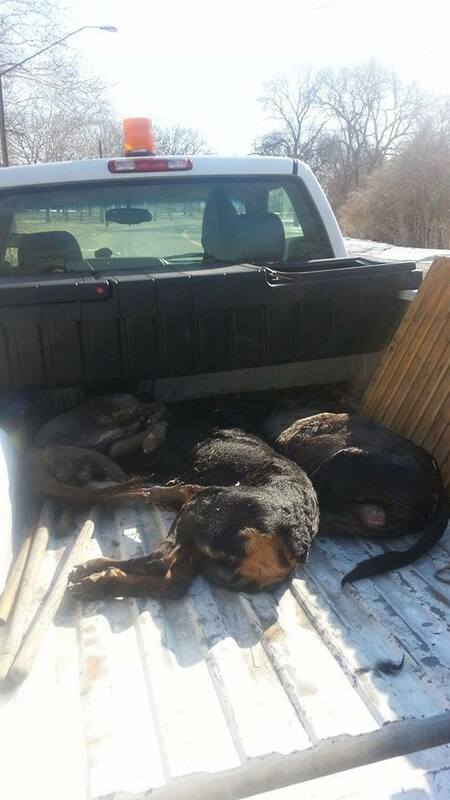 A city employee made a terrible discovery as the snow melted away in Detroit's River Rouge Park this week -- dozens of dead dogs, the bodies dumped like garbage on the ground. Detroit saw near-record amounts of snow fall this winter (more than 90 inches at last count), which allowed the animals' bodies, some still frozen, to go undiscovered until now. It's likely that some of the dogs, mostly pit and mastiff mixes, were kept for fighting before their deaths, CBS Detroit reported. Others may have been strays or even recently abandoned by their owners. Twenty-eight corpses, many covered in scars and lacerations, were found Thursday in the park. Greg Ostrander lives near Rouge Park and walks his dogs there daily. He's tired of all the garbage dumping inside the park, but he said the worst thing is finding dead animals. Eight months ago, he came across the body of a dead Rottweiler. He said he called Detroit police and animal control numerous times to take the body away. He ended up burying it himself. 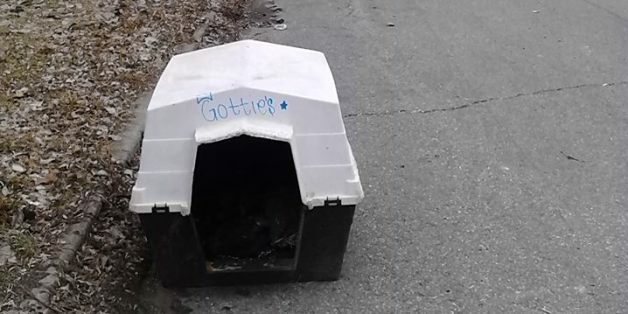 On Thursday, Ostrander said, he found two more dead dogs in the park, including one lying inside a discarded doghouse. Dozens of other bodies were found shortly thereafter. Scroll down to see photos of the dead animals found in River Rouge Park. The graphic images may be disturbing to some readers. "It's a dumping ground for people who don't want their dogs no more and people who are dumping dead dogs down there," Ostrander said. "I have no idea why people can't just bury their dogs in their yard." Though reports that 50,000 stray dogs are roaming Detroit are likely false, a recent study by the World Animal Awareness Society (WAAS) suggests that about 1,000 to 3,000 stray canines are actually loose in the city. "Although there are not tens of thousands of loose dogs on the streets of Detroit, the abuse, bites, surrenders, fighting, breeding, neglect, and over-crowded shelters leading to high euthanization rates indicate substantial problems on a large scale," WAAS Executive Director Tom McPhee wrote in the report. Kelley Labonty is the founder of the Detroit Animal Welfare Group, which is helping to rescue and foster the city's stray dogs. DAWG currently houses 87 dogs with foster caretakers and someday hopes to buy a foreclosed farm at which to feed and shelter rescued animals. "With 33 dead dogs being found in the last two days at this park, we need to inform and educate the community," Labonty said. DAWG is organizing a search of Rouge Park on Saturday, March 22, to look for more animals. Given that the park is over 1,200 acres, the group is asking the public for help. Volunteers will meet at Charlie's Bar at 1503 Springwells St. in Detroit at noon. More information on helping or donating can be found at the DAWG Facebook page. In the longer term, Ostrander hopes the city will hire more security or install surveillance cameras to discover who is dumping animals, both live and dead, in the park. On the day he found the two dead dogs in Rouge Park, Ostrander said he also discovered a young black-and-white dog running around the same area. He took the animal home with him, and a friend has already decided to give it a home. That dog is about the 30th animal that Ostrander estimates he has saved from the area around Rouge Park. "I'm just a person who cannot turn my head from an animal in distress," he said. "If they don't run from me, I take them home." Note: The images below may be disturbing to some readers.